If Detroit had an actual face, Bruce Giffin would have already taken its picture. Giffin has been taking photos in Detroit for 25 years. And when you spend that much time in the city, you start to get a clear view of Detroit’s identity. That very identity is showcased fearlessly in Giffin’s 11/6 photography exhibit, The Face of Detroit, held in conjunction with the group Detroit Exposure. The exhibit of roughly 60 images is held in a collective gallery workspace on Rochester Road in Royal Oak. 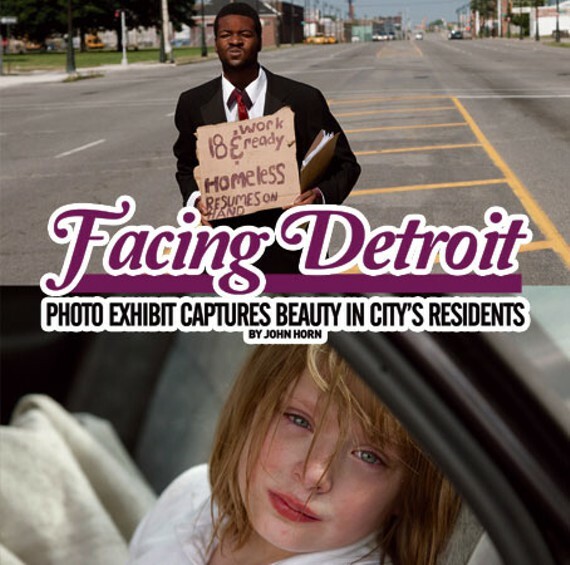 The Face of Detroit is the space’s first exhibit. Giffin’s work lately is a compelling series of up-close photographs of various people he has met in Detroit. Some of them are a little rough-looking; others, not so much. But the raw detail that comes from taking a picture a few inches away from the face of a man or woman with decades of hard living carved all over it yields a photographic image with a distinct type of power. This all developed more than a year ago, when Giffin was showing an Italian photographer around the city. When Giffin saw someone on the street who looked like a fascinating subject, he’d approach the individual and go from there. These are strangers who don’t know the photographer, in an environment where the unfamiliar isn’t exactly trusted. Many of Giffin’s photo subjects are of the few remaining people that make up Delray, a well-worn part of Southwest Detroit that seems to defy overall perception of just who makes up Detroit. The uninitiated could call it “that pocket of the city with the white, backwoods weirdos,” but it’s just another neighborhood in Detroit. And much like too many parts of Detroit, Delray’s landscape is composed of old, tattered buildings and trailers; odd-looking characters with a challenging employability; and a sometimes overwhelming sense of learned helplessness. Giffin sees it differently in his exhibit. “There is a statement that I make: one-third of these people are homeless, two-thirds are not, and it’s not really important to know which,” Giffin says. “You and I, and everybody, are about an inch away from being homeless ourselves. Sometimes, you can’t stop it. Delray, downtown, up Chene Street, along Hamilton Avenue — this is Giffin’s roadmap in the city, streets he doesn’t just drive along, but gets out and walks, talking to people and capturing their images in their most natural environment: the street. Detroit is no place for the soft. But its accessibility to the unfamiliar is wide open, and some of the rewards can be magnificent. In his former position as a photography instructor, Giffin would take groups of students through the city on weekends. One Sunday, he would guide a group of eight or 10 community college students through the Michigan Central Station or the empty Fisher Body Plant. Everyone takes photos. For some students, it was their first time in the city, despite growing up less than 30 minutes away from Michigan Avenue or Highland Park. That lack of curiosity with Detroit speaks to a concern reaching back generations: suburban kids growing up with strict orders from their parents not to cross Eight Mile. His passion for imagery and respect for the city has yielded a bounty of photographs that will hang on 11/6 at Detroit Exposure. The exhibit’s uniqueness pairs ideally with both the venue and the group behind the space. Detroit Exposure is a collective of young, local photographers who have pooled their resources to give themselves their own home. There are nine photographers and they split the cost of the Rochester Road studio nine ways, from rent to utilities. And inside, they can create their own work environment. From exhibits to photo shoots to events and workshops, the potential of the space is limited only by the collective’s drive and imagination. Photographer Philip Southern is a member, as well as a former student of Giffin. He says The Face of Detroit exhibit is emblematic of not only Giffin’s work, but the landscape of the city. Published previously by Real Detroit Weekly Magazine. Photo courtesy of Bruce Giffin.